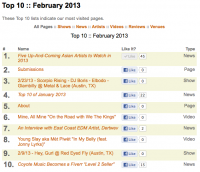 Announcing the Top 10 most visited pages on CoyoteMusic.com in February 2013! On the next-to-last day in February, Coyote Music experienced a veritable deluge of traffic from all over the world. The attraction? Our article on Asian artists CNBlue, Jay Chou, Jayesslee, Terracotta, and Zee Avi. 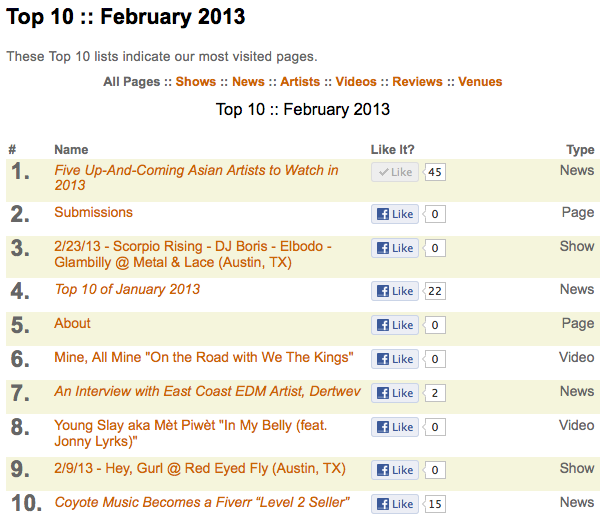 In just two days, "Five Up-And-Coming Asian Artists to Watch in 2013" became the most viewed page in Coyote Music's 17-year history! From Facebook Shares to Twitter Retweets & Favorites, this story was circulated to hundreds of thousands of music fans worldwide. Beyond our artists from across the Pacific, Coyote Music's Submissions page continues to attract new artists, coming in at #2 in this month's Top 10. We have been adding several artists every week, for several months. The growth is unprecedented, but warmly welcomed and appreciated. The second episode of Spike TV's Bar Rescue turned Austin's disgusting dive bar, Headhunters, into a shiny new steampunk-themed venue called Metal & Lace. The renovation left the bar with a premiere sound system and shiny new lighting rig. The first Saturday after the show aired, Scorpio Rising (Austin), DJ Boris (Austin), Elbodo (Houston), and San Antonio's Glambilly played a killer night of music. Our listing for that show was the #3 most popular page this month on CoyoteMusic.com. At #4, our January Top 10 drew some attention and our About page tallied the #5 spot. A video we shared with you over a year ago by the Florida band Mine, All Mine earned the #6 spot. They're a tight, fun punk band in the vein of Jimmy Eats World, Green Day, etc. Solid band. Electronic music is represented in the form of our interview with a Richmond, Virginia EDM artist at #7. Rapper Young Slay's video for "In My Belly," a Wyclef-sounding cry for hunger awareness, landed at #8. And at #9 was cover/mash-up band Hey, Gurl's monthly stop in our Top 10. Their Red Eyed Fly show included a teen reggae band, and one of the best bands we've seen in a while: San Marcos' Chasca. You'll most definitely here more about them in the near future.